Ever since their arrival on the ice hockey scene in 2005, Sidney Crosby and Alexander Ovechkin have been the promotional linchpins of the National Hockey League. 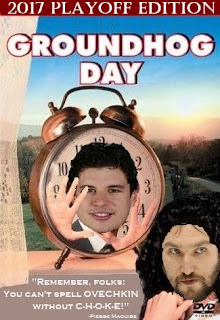 "Just put your...little hand in mine..."
Along with Evgeni Malkin, the trio of superstars have accounted for 5 of the last 11 Art Ross Trophies (awarded to a player for leading the league in scoring), and 8 of the last 11 Maurice "Rocket" Richard Trophies (earned by leading the NHL in goals). During that time, their respective teams– the Pittsburgh Penguins and the Washington Capitals– have met twice in the Eastern Conference Semi-Finals, and in both cases (2009 & 2016), the Penguins emerged from the series victorious and went on to capture the ultimate prize, Lord Stanley's Cup as champions. As the fates would have it, Sidney Crosby, Evgeni Malkin....and yes, Marc-Andre- Fleury...will get their third, and likely, final shot at Alexander Ovechkin starting this week. The Presidents Trophy winner Capitals will have home ice advantage whenever World War III commences. "And the Air Canada Centre fans go U-S-A! U-S-A!" The young kids from Toronto gave this series all they could muster- FIVE overtime games' worth- but ultimately, the experience and goal-tending of the Washington Capitals was just enough for Alexander Ovechkin avoid yet another first round playoff exit. Marcus Johansson played hero for the Capitals, scoring the tying goal late in the third period, and once again found the net a mere 6:31 into the extra-session. Auston Matthews (he was born in America! have you heard this yet?!) 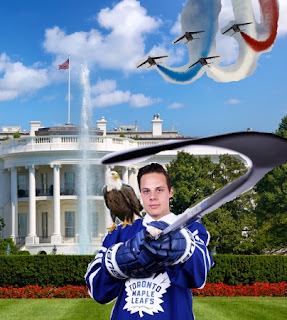 had previously given the Leafs the lead (and hope) at 7:45 in the 3rd when he corralled a wild bounce off of the boards and then elevated a bouncing puck past Braden Holtby to send the Air Canada Centre into absolute bedlam. Alas, it was the Capitals that were able to maintain possession the rest of the 3rd period and into overtime. After a dubious icing call that left some weary Maple Leafs players on the ice, Washington won the offensive draw, and set up Justin Williams for a hard shot from the left circle. Andersen made the initial save, but Johansson was...Johnny...John...Johansson on the spot...? and flicked the rebound past Andersen's outstretched pad for the win. Now that the first round of the NHL playoffs has come to close, Captain Hindsight has the following observation to make: hockey analytics have done an excellent job describing events, but a terrible job of predicting events. We need look no further than the Boston Bruins, the analytic crowd's great sleeper pick, picked largely of their possession numbers (Corsi, Delta Cor, Fenwick, etc.). In the end, a series of injuries to necessary cogs David Krejci, Torey Krug, Adam McQuaid et al put forth a Boston team capable of only wielding one dangerous line (Bergeron with Marchand) and the Bruins' defense was left hoping that Tuuka Rask could channel his inner Tim Thomas (which he couldn't,) and so TEAM CANADA lost the Maple Leafs, but kept the Ottawa Senators in the Stanley Cup Mix. Ottawa's goal, scored by Clarke MacArthur, was extra special because of his health issues. He & his family decided to give hockey one last go, and now, his team is moving onto the second round. As for Pittsburghers, rest up, drink lots of Grim Rutherford water, and be prepared for a nerve-wracking and terrifying contest between the Penguins & Washington Capitals. Call this one the Battle of Mordor: the one series to rule them all!